A crochet lapghan is usually smaller than an afghan blanket and is great to keep legs warm when watching TV etc. It is also ideal for wheelchair users, I have designed this one with a one row pattern which makes it work up fairly quickly. 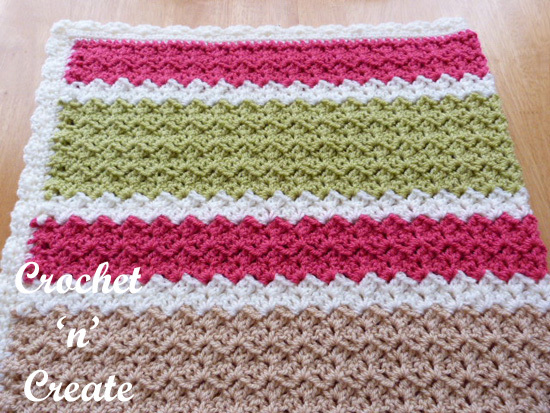 See my free Sunshine Lapghan Blanket pattern. Shell. 3dc in same space or stitch. Pattern Row – ch3, 1dc in base of ch3, work (2dc, ch2, 1sc) in next ch2 space, * skip 2dc and sc, work (2dc, ch2, 1sc) in next ch2 space, * rpt from * to * to last 3dc and ch3, skip 3dc, 2dc in top of ch3. Turn. Next Row – ch1 1sc in base of ch1, 1sc in next dc, * skip 1sc, 1sc in each of next ch2 space and 2dc, * rpt from * to * to last dc and ch3, 1sc in dc, 1sc in top of ch3. Fasten off Turn. 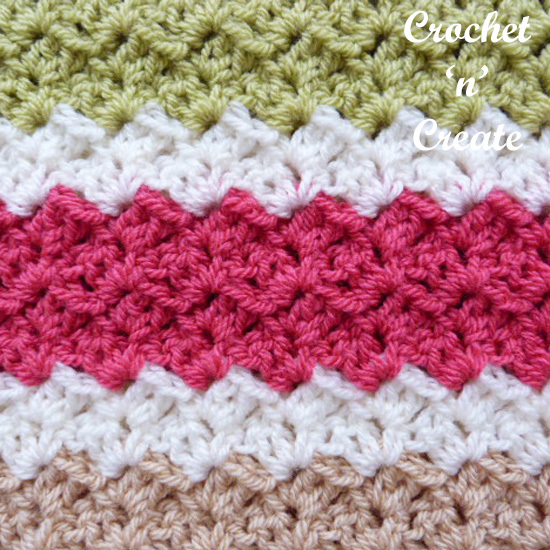 Border – Using 5.50mm hook and color 2, ch1, 1sc in base of ch1, 1sc in each sc to end, 3sc in corner, working down first side of lapghan work 100sc evenly in row ends to end, 3sc in corner, 1sc in each ch along starting chain edge, 3sc in corner, work 100sc evenly in row ends up second side of lapghan to end, 1sc in corner, sl st to first sc on beginning of row. Turn. Starting with ch1, 1sc in base of ch1, (working 3sc in corners, slip stitching and turning at the end of each row), work 2 more rows of 1sc in each sc to end. 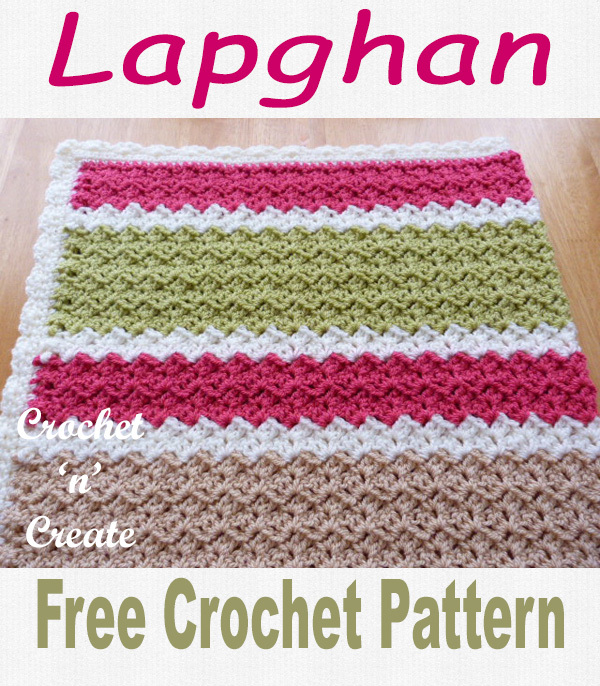 Hope you enjoy this free crochet pattern for a crochet lapghan. 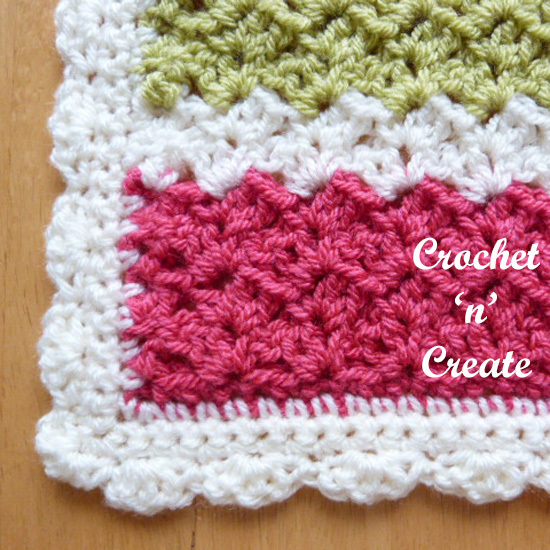 The written instructions and pictures for this free crochet lapghan pattern are copyrighted to crochet ‘n’ create © 2018. 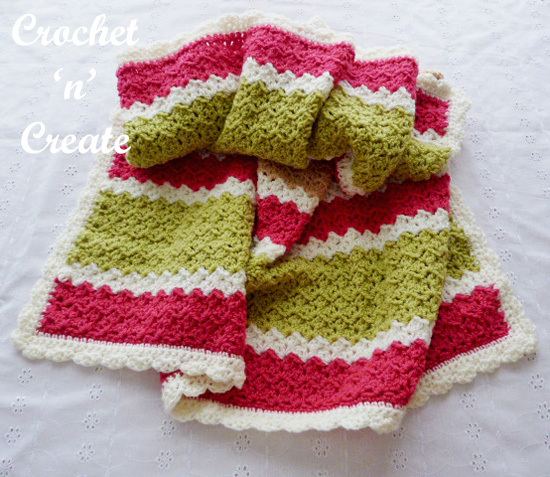 This entry was posted in crochet blanket, crochet for the home and tagged crochet, crochet blanket, crochet for home, free crochet patterns on 2nd January 2018 by crochetncreate.